The hot season is over, and locals and visitors are breathing a sigh of relief as temperatures drop to the merely unbearable. Likewise, murders have fallen in frequency, probably also due to the seasonal changes, and we should be able to expect at least a 50% chance of living through the next few months. With the mild season also comes the usual increase in the number of Jawas in the streets of our fair city. While we embrace the flow of commerce that inevitably surrounds Jawa arrivals, we must officially caution against the many cultural misunderstandings that can arise. 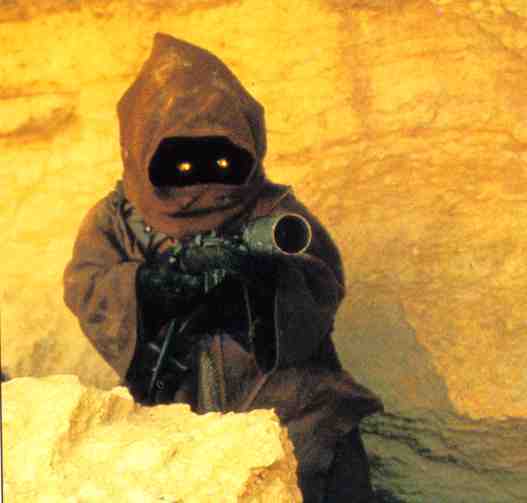 Please do not make the (offensive, and occasionally fatal) mistake of considering Jawas to be primitive, childish, or easily intimidated. Nobody has put together a serious scientific study of the migratory habits of the Jawa population, so consider this an invitation. Then again, bookish types asking too many questions seem to be in even shorter supply than usual, so we may have to extend this opportunity to offworlders. Local fixture Chalmun is holding his annual mortgage refinancing ‘fundraiser’ this weekend, both in and around his cantina. Apparently he is more motivated than usual, having violently dismembered the favorite droid companion of a visiting noblewoman from Manda. It’s likely that you’ve been to the cantina, whether you admit it or not… but just in case, here are the directions: go to the big old crashed starship in the center of the city, and turn around. Once you arrive you can expect to see rough scallions of every size and shape. Be wary while you are in the area. There will be a surprise waiting for anyone who is caught slipping even just a little. It really does take quite a but not only to keep breathing around here but to make a little extra cheddar in the meantime you must be either particularly vicious or especially conniving. short of these traits you should be very good at watching your back. It is no surprise that some of the biggest black market transactions take place here. It is very hard to track or check all of the people in the are even if someone was interested in doing it. At any given time there could literally be dozens and dozens of halfway shady to straight up dark transactions and negotiations taking place. The best that anyone around here hopes to accomplish is to get in and out with their life intact. If they can find the deal they have been looking for, well that is just icing on the cake.